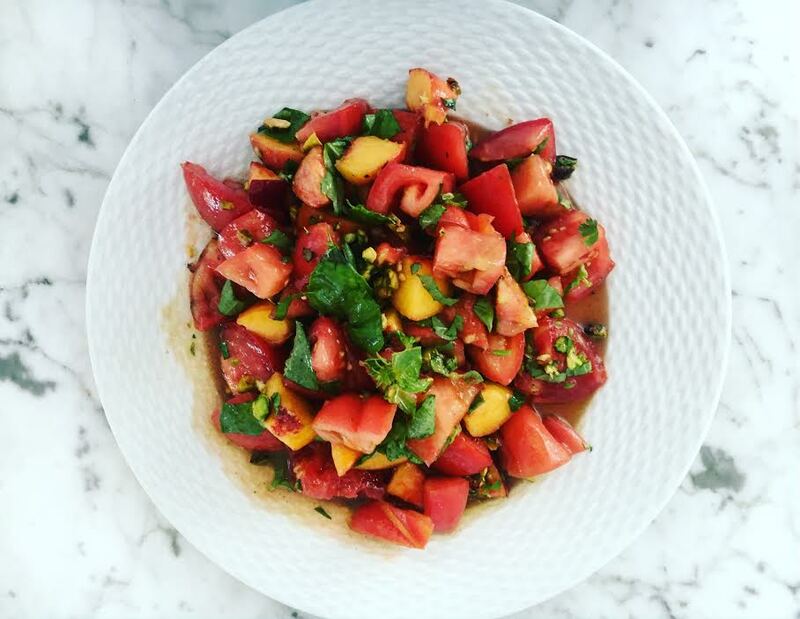 A proper summer salad, celebrating fresh tomatoes and peaches. Little needs doing to these sweet fruit in the height of season. So this is a quick and easy, but delicious and quirky enough to to impress guests. This makes a little extra but it’s a great staple dressing to have in your fridge, so save any extra for another salad. Roast your pistachio at 160c for 10 minutes, then roughly chop. Cut the tomatoes and peaches into bites size pieces, I like to do these at different angles for some more fun shapes then just squares. When you’re ready to serve, mix through your dressing a tablespoon at a time, as you won’t need all of it, season to taste. Finish by mixing through torn basil and top with chopped pistachio.